Bvlgari’s latest luxury Resort that opened its doors in Dubai last December on Jumeira Bay Island has already become the destination of choice for both visitors seeking a ‘Resort’ experience on an island within the heart of a city, and the sophisticated Dubai crowd looking for the best in terms of dining, relaxing and escaping. 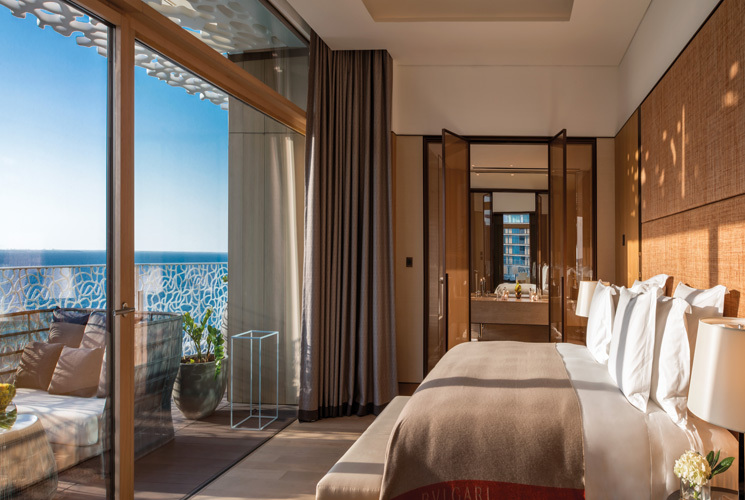 Designed by renowned Italian architectural firm Antonio Citterio Patricia Viel and embracing a maritime theme, the Bvlgari Resort Dubai includes 101 hotel rooms and suites and 20 hotel villas, all exquisitely furnished with the highest quality Italian luxury furniture brands in an expression of the quality of ‘Made in Italy’. 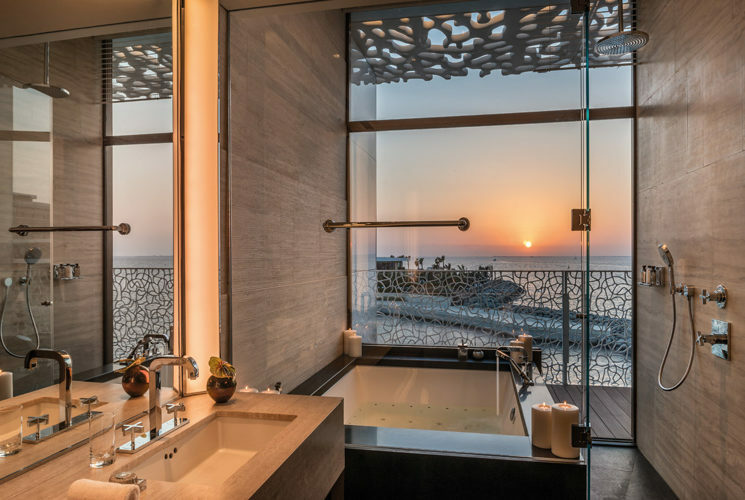 All rooms and suites have expansive views over the breathtaking Dubai skyline or the Arabian Gulf, with large balconies to truly soak up the magnificent scenery. The Resort’s dining offer presents several sumptuous options, from Il Ristorante – Niko Romito, interpreting the exquisite flavours of Italy with modern simplicity, to Il Café, where a mix of Italian and Arabic dishes can be enjoyed on the deck in front of the Marina. Besides, La Spiaggia restaurant serves international food and drinks in the sea breeze delight while the soon-to-open Hoseki will prepare the purest Japanese cuisine at its best. The iconic Bvlgari Bar, is the place to be for pre and after dinner drinks while soaking up the magical dusk on the outdoor terrace, with views sweeping across the Arabian Gulf. Some other unique features such as the Resort’s beach club, with private villa cabanas and an outdoor pool, the 1,700 sqm BVLGARI Spa with a 25m swimming pool, and the world’s first Bvlgari Marina & Yacht Club hosting 50 berths, add further luxurious touches and complete the guest experience. 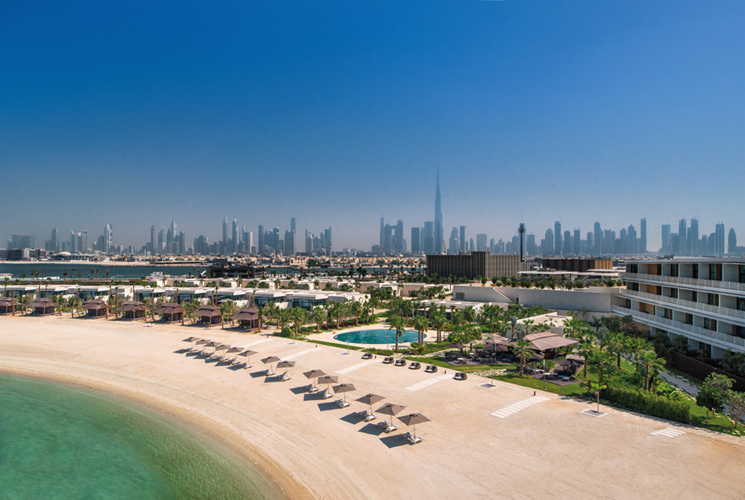 Conveniently situated in the stunning Jumeira area in the centre of Dubai, the Resort is just a short drive from many of the city’s attractions such as the magnificent Al Fahidi Historical Neighbourhood along Dubai Creek, and the trendy areas of Dubai downtown. Silvio Ursini, Bvlgari Vice President comments as follows: “We couldn’t be happier to enter the T+L IT list as it represents for us a reward to all of our efforts to offer unique and exquisite hospitality experience to our guests. We are extremely proud to have been selected by T+L and we renovate our commitment to deliver an unrivalled service and the best Italian contemporary luxury excellence”.